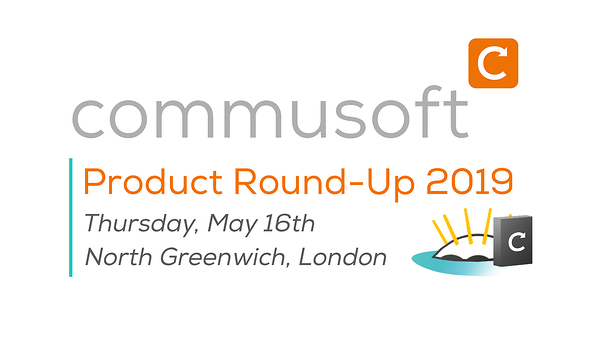 We're incredibly excited to announce that we are hosting an event this May - the Commusoft Product Round-Up 2019! 🎉 Join us in London to learn about releases from the the past year, check out our upcoming stock control feature, and ask any questions you may have in our Q&A session. The event will run from 10am - 3pm on Thursday May 16th, 2019. It's perfect for anyone who wants to meet the team, learn more about the product (especially stock control! ), and network with other Commusoft users. We understand that Commusoft is being regularly updated, which can be difficult to keep up with. That is why we're going to review the many product updates from the past year, covering how they can benefit your business, as well as demonstrating how to use them. That means features like intelligent scheduling, van tracking, online portals, new reporting tools, and more! A large chunk of the day is going to be dedicated to our upcoming stock control feature, which will be released in May. This is a fantastic opportunity to see our new stock system first hand, learn how it can revolutionise stock management in your business, and find out the next steps to implementing it. Over lunch we'll be hosting a Q&A session. Many of the Commusoft team will be there to take your questions and offer best practices, ensuring you're getting the most out of your software. Why not bring your laptop so you can implement suggestions right there and then? Commusoft Product Round-Up 2019 is being held on Thursday, May 16th 2019 at our office in North Greenwich, London. We're based right next to the O2 Arena, so it's easy to get to. Join us in our conference space where we'll be hosting the stock and round-up workshops, our Q&A session, and networking with all of you. Don't worry, we will also be providing drinks and snacks to keep you going!